My son was seen by the Dentist Dr. Michael Derose in Pueblo Colorado back in 2000. The dentist went to visit him at the Head Start and said he needed work done at that time which included 5 caps and 2 baby root canals. 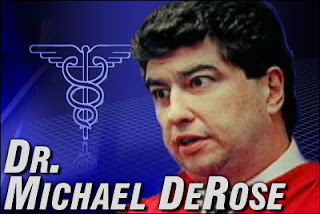 Appears Dr. Michael DeRose was using Head Start to patient shop. Many, not all, dentist go under the guise of helping the children who can't get to the office. I did not understand this. I took him to another dentist who said he needed to be seen in Pueblo by this dentist because my son would not sit still and let him look at his teeth. Who was the other dentist you took your child to? They may have been in cahoots together. I took him to Pueblo for his visit and waited for about 3- 4 hours while my son was taken to the back for work on his teeth. Before he went in I asked started to follow the dentist and my son to the back and he said that parents were not to go to the back because it made it harder for them to work on the children. This is such crap! Now, I know sometimes children do behave better when parents are not around, but never let any kind of treatment like this happen without you being present. Ok, I understand an operating room, but guys know what I mean. He said we will look at his teeth and if we have any questions we will come back and talk to you. I was getting really impatient and went to the side of the building where my car was parked to get something from the car. I heard this child screaming from the other side of the wall. He was screaming in pain. I stopped to listen by putting my ear to the outside of the wall and realized it was my son! You can tell they were hurting him by the crys he was making. He was screaming. A few times it sounded like they would cover his mouth so that he would not scream. I hurt him gag like he was choking. I immediately went and got my husband to come and listen too. I went inside and asked the receptionist to check on my son. She came back and said that the doctor said he was fine he was just upset because they had to hold him down. I waited a little longer and the doctor came out to talk to me and let me know what was done. He said that my son had gotten sick because of the crying he did and the medicine they used. I'm sure now you know the horrible torture your poor child experienced. I am so so so sorry for you and your son. How heartbreaking! When my little boy came out he was sweating and could barely talk and said Dr.hurt, dr hurt. My son was still in the process of learning how to talk at that time. The whole time driving home he cried and said dr. hurt me dr hurt me. He could not even eat. He was supposed to return to have more work done but I never took him back. Recently I looked in the paper and saw that this dentist was completing unnecessary work on children with medicaid and hurting them. I was so upset and angry because my son was being hurt for no reason and I could not be back there for him. They are making this man pay 10million back to the government. Why is he not charged with abuse on a child? He hurt these children and traumatized them. EXACTLY, Toni. Why is HE and other dentists that do this not in prison like all the other child abusers out there!!?? Sorry to say it's because it goes unreported. What Dr. Michael A. DeRose and his cronies have done to thousands and thousands of children across the nations is unacceptable! And these guys not only had private practices doing this, they started a whole industry set up to abuse and traumatize children and take millions and millions of dollars of your tax money for doing so! How any of those involved in this sleep at night is beyond me. I thank you, Toni, for stepping up and telling your story. That takes a lot of courage. Many parents don't want to speak out for so many reasons. One, is they are afraid it would make them (the parents) look bad, or been duped or taken advantage of, etc. I've heard one story where a dentist would call child protective services and report you for child neglect if you refused to let him do his "drilling for dollars"! Yep, it's true! Not just one parent either...many! You shouldn't! These guys dress up in authoritative garb, they are supposed to be educated, you are supposed to trust them. Our government even says you can trust them, by giving them tests and training and licensing etc. If you can't trust your doctor, dentist etc, who can you trust, right? Please, Toni and parent like you, step up and file a complaint with Colorado's dental board! Keep a copy of the complaint you file as well. This is something that people are really going to have to step up and report before it will ever end. Thanks again, Toni for letting your story be heard. This is just appalling isn't it?